We have written before of Quest’s new emphasis on engagement and advocacy work with British bishops. 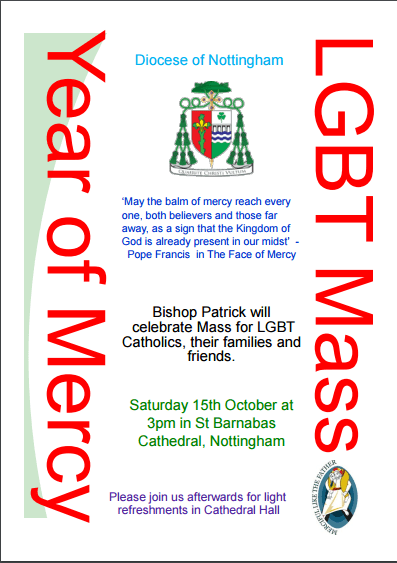 One of the visible fruits of this is a forthcoming Mass for LGBT Catholics, to be held in St Barnabas’ Cathedral, Nottingham. Earlier this year, Ruby Almeida as Quest chair, accompanied by Claire Jenkins of the East Midlands regional group, met with Bishop McKinney. Later, Claire and other members of East Midlands had further meetings with the bishops, culminating in agreement on the forthcoming Mass, as described in the poster pictured above. We hope that Quest members, their family and friends from East Midlands and other regions, wlll support this notable Mass. In Nottingham diocese, we hope furthermore that this initiative will lead to further engagement with the diocese, and additional pastoral outreach to LGBT Catholics in the years ahead. Beyond Nottingham, engagement and advocacy with Catholic bishops and other groups will continue.